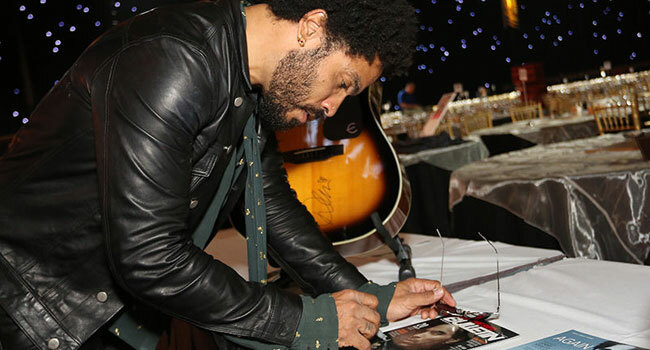 Music memorabilia signed by Garth Brooks, Zac Brown, Dave Grohl, Luke Bryan, Lenny Kravitz, Kendrick Lamar, Demi Lovato, Bruce Springsteen, Meghan Trainor, Carrie Underwood, The Weeknd, and more is currently up for grabs at the latest Grammy Foundation and MusiCares Charity Online Auction. The latest GRAMMY Charity Online Auctions is presented in honor of the 12th annual MusiCares MAP Fund benefit concert honoring legendary GRAMMY-winning singer/songwriter Smokey Robinson. Presented in partnership with Kompolt, the items are available for bid now through June 3rd at ebay.com/grammy. Winning bidders can enjoy extraordinary rock memorabilia, trips around the world, tickets to hot concerts, and meet and greets, with all proceeds benefiting the GRAMMY Foundation and MusiCares. Items available to bid include merchandise signed backstage at the MusiCares MAP Fund benefit concert by Andra Day, Smokey Robinson and more, premium concert and meet and greet experience with “Weird Al” Yankovic, luxury trips around the globe to international destinations such as Paris, Thailand and Turkey as well as a chance to bid on your chance to win tickets for two to the Billboard Hot 100 Music Festival in New York, and the first opportunity to win a VIP package to attend the 59th GRAMMY Awards telecast in 2017. Under the banner of GRAMMY in the School, the GRAMMY Foundation produces a range of distinct education programs — across the country throughout the year — that serve high school students and their schools, including GRAMMY Camp, GRAMMY Career Day, GRAMMY Camp — Jazz Session, and GRAMMY Signature Schools. The GRAMMY Foundation also offers preservation and advancement initiatives, fosters dialogue about compelling issues facing the music industry, supports projects that increase the understanding of music and its role in society, and raises public awareness about the urgent need to preserve our nation’s recorded sound legacy. These programs include the Entertainment Law Initiative, the Grant Program (with funding generously provided by The Recording Academy), and the Living Histories program. MusiCares ensures music people have a place to turn in times of financial, medical and personal need by providing programs and services including emergency financial assistance, educational workshops, flu shots, hearing tests, and medical/dental screenings. The MusiCares MAP Fund allows access to addiction recovery treatment and sober living resources for members of the music community; and Safe Harbor Room support, weekly addiction support groups and the MusiCares Sober Touring Network provide ongoing recovery support.